Ilan Stavans is Lewis-Sebring Professor in Latin American and Latino Culture at Amherst College. 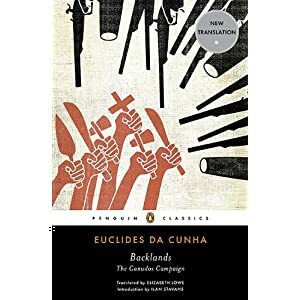 He wrote the introduction to the new translation of Euclides da Cunha’s classic, Backlands: The Canudos Campaign, just out from Penguin Classics. Euclides da Cunha is a towering literary figure in Brazil, a man who, more than a century after his death in 1909 at the age of 43, is recognized as essential in the shaping of the modern Latin American nation. Given his extraordinary talent as a newspaper correspondent, he deserves to be equally known abroad on the basis of his book Backlands: The Canudos Campaign, which is, simply put, one of the most outstanding chronicles of war ever written. A civil engineer, an army lieutenant, and a journalist from an upper-middle class family in Rio de Janeiro, Da Cunha was a rather innocuous figure who, judging by his other writing, would probably would have been forgotten by history until stumbled upon the opportunity that would ultimately make him famous when, in 1897, he accepted an invitation from the newspaper O Estado de São Paulo to be what we would call today an embedded reporter with the Fourth Battalion traveling to Canudos, a rebelling province in the northeastern state of Bahia. Starting in October 1896, Antônio de Conselheiro, a loquacious religious leader equipped with a messianic theology that was a hodgepodge of the imported Christianity the Portuguese brought with him from Europe and pagan beliefs of the local, indigent, mostly black population in inhospitable landscapes like the one where the unrest was taking place, was becoming a threat, first and foremost to the region, but as it gathered momentum, to the entire nation as well. There had been repeated attempts to qualm the subversive forces, but every one of them had resulted in defeat. The agitation had become the focus of a growing media, and the focus quickly evolved into an obsession. Da Cunha, like other intellectuals of the time, was fascinated with the events and before he was approached with the invitation he published a couple of articles on the topic. He considered the impact the Canudos ordeal could have to Brazil, a country that had become independent in 1822 but where slavery wasn’t abolished until 1888. By the time da Cunha arrived to the scene, news of Conselheiro had achieved legendary proportions in the capital. Was he a tyrant in disguise whose charisma could metastasize his standing beyond Bahia? Were the limits to the government’s response its own unruly population? Was race and not just class a factor in the attitude the urban population had to Canudos? And was the sore point in Canudos proof that the enormous expansion of land that Brazil represented could not be coalesced under a single centralized power? Da Cunha found in Canudos more than he bargained for: an understanding of the role of war in human affairs; the need for a balanced journalism that creates its own sphere away from the influence of the government’s interests and those of wealthy, influential social sectors; and, perhaps more important, the realization that the writing of history is never about good versus evil but about the ambiguity that results of clashing visions of the future. In the end, he witnessed less than a month of a year-long military campaign in which the Brazilian army crushed the jagunços, as Conselheiro’s followers came to be known, and during which approximately thirty thousand people were killed, five thousand of them soldiers and the rest the local population. He was troubled to such a degree by the government lies and the fervor of the insurgents that it took years to complete his masterpiece, finally published in 1902. Da Cunha would spend more years revising, expanding, and deepening its content, aware as he was that the farther away he was from what he saw, the more complex everything became. The book, canonical today not only in Brazil but across Latin America, is magisterial in scope. I read it for the first time in Spanish when I was my late teens, in my native Mexico City, and was immediately taken by it. Rereading it now, thirty years later, in the new English translation by Elizabeth Lowe called Backlands, a title that perfectly evokes the simplicity of the Portuguese original, Os sertões, I have seized upon its promise more fully. Da Cunha pays attention to detail, allowing the reader to understand the ins and outs of Brazilian history, but he zooms back to offer a multilayered profile of Conselheiro. That he failed to humanize him is, in da Cunha’s own view, a tacit failure, for the reporter realizes the he also has become a victim of the war. While reporting on the atrocities, he came to understand that he is a man of contradictions, allergic to facile black-and-white characterizations, and that the government, and the malleable public opinion behind it, didn’t like profiles that rationalize sedition. All this is to say that Backlands ought to be read alongside the great chroniclers of war, from Flavius Josephus to Ryszard Kapuściński. It has the traction of an epic novel and the inquisitiveness of a travelogue to a foreign land. Da Cunha envisioned the volume as a treatise on citizenship in the twentieth century. He envisioned himself as belonging to an intellectual tradition that hoped to explain a particular social occurrence through a prism that included disciplines such as anthropology, geography, psychology, ideology, natural science and the history of warfare. If the sum of its parts succeeded in coming together, it’s due in large part to da Cunha’s intellectual restlessness. He didn’t see his own citizenship, his Brazilianness, as a fait accompli. To protect the modern nation, he suggested, the state needed to rally the population around a myth of origins. The state was simultaneously the safe-keeper of that myth and the machine responsible for perpetuating it, and those who questioned it were judged undesirables and needed to be extricated from the collective body. Doesn’t it ring frighteningly au currant?